In February 2012, two friends and I started a podcast. It wasn’t a complex idea. They’re two straight male comedians and one day, they made a joke about doing a dating advice podcast in which they’d advise only non-straight males. Why would anyone want their advice, was the hilarious joke. I took it seriously. That could be funny, I thought, and actually occasionally helpful. So we called it the Guy Friends Podcast, we did a test episode, and we signed up for Soundcloud, which seemed then like the easiest and best way to post episodes and feed them to iTunes. 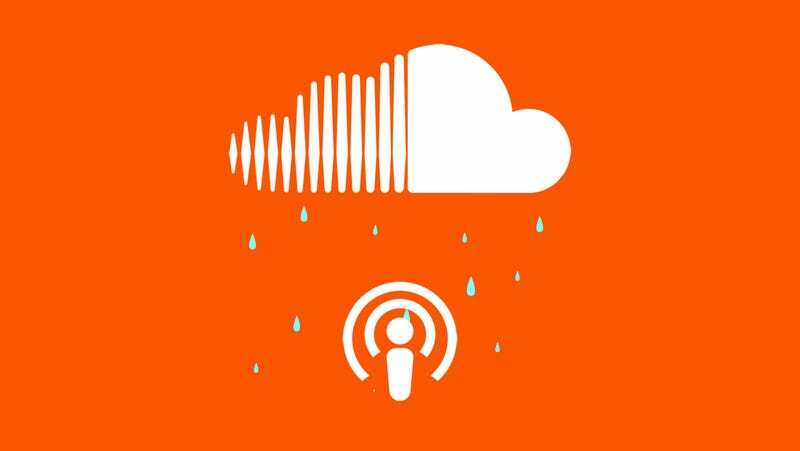 Our podcast lasted until this past week, when Soundcloud pulled our entire archive off their platform, as they have in recent months to a slew of individuals big and small. It’s clear foreshadowing: The company’s future financial success is predicated not on small payments from small users, but on big deals with large record labels. We certainly knew this was coming, but whether there was anything we could do about it was another story. When we started the Guy Friends, I was working for the public radio station WBEZ in Chicago, which was using Soundcloud as a way to get its radio content out to a more internet-friendly audience. In those days, Soundcloud was very amenable to the Guy Friends; according to our emails, they allowed us to sign up for their then-beta “podcast program,” which meant they upgraded our free account to paid premium one for a year, giving us unlimited hours of uploads, plus the ability to see play counts and who was listening where—all for free. It was, for a team of people who had very little money and were just starting out in the business, an extremely encouraging way to start. The way the episodes worked is the “Guy Friends” Josh and Aaron would introduce the user-submitted or crowdsourced questions, and then answer two or three of them, before wrapping up at the end with a segment where I would typically lambaste them over their advice. In between these segments, I’d intersperse short music clips—all remixes that other Soundcloud users had uploaded, but only those that were labeled available under Creative Commons. How music can be used in podcasts under fair use is complicated, as fair use often is, but I’d tried to purposely use tracks that were more “transformative” than regular remixes, and I credited them in each episode. For the first couple episodes, as we were testing things out, I’d intro’d and outro’d using Rufus and Chaka Khan’s “Tell Me Something Good,” which Soundcloud rightfully shut down. From then on, I chose remixes and mashups that the platform had allowed users to upload to the site, and that those users had said others could download and use. We were transparent about this process, creating a whole playlist on Soundcloud of the tracks we’d sampled for listeners to enjoy. After our year of a free and easy Soundcloud life was up, we figured we’d have to strap in and and pay the then $200-plus to keep what was then called a “Premium Pro” account. As fate would have it, we learned through our new co-producer (and my former WBEZ co-worker) Lauren that Soundcloud wanted to give WBEZ employees free personal accounts, and that the Guy Friends account would qualify as one. Though we’d already paid for our Premium Pro account, Soundcloud even refunded us our money. For the next couple years, the show proceeded as normal; Josh and Aaron moved to New York, we started recording here, continuing to treat the podcast as something slightly more serious than a hobby we did in our spare time. The guys wrote blog posts for How About We’s Date Report. We did a really fun live show back in Chicago that our friends and listeners attended. But there’s no real record of that work online anymore, because last week, Soundcloud terminated our account for “copyright infringement” on old tracks that purportedly used remixes no longer deemed acceptable, remixes that were considered in violation of the Digital Millennium Copyright Act. You can’t listen to anything we’ve ever created in three-plus years on iTunes either, as the RSS is broken. We face a dilemma many others who work online have dealt with as websites are shut down or reworked; our links are dead, our content is sailing around like ghost ships on the internet. In July, Soundcloud had sent us an email warning us about the first of three “strikes” for an episode they said had been reported for including copyrighted music (it sampled a Tinashe song), and telling us that they had taken the episode down. An automated email said we could file a dispute about the removal, but as would be the case each time we emailed them back and explained the situation, a person from the “SoundCloud Copyright Team” either said there was nothing they could do or did not respond. An excerpt from an email from Souncloud, which was the most detailed response we received to our questions about our violations. Last week, we hit our three strikes; now every episode has been removed, following the original three they took down. Before that, with each strike, there was no explanation about how we could protect at least some of our content, or save our account going forward, except to tell us to take down every track that might be considered in violation—which, according to Soundcloud’s new crackdown, seemed like every single one. With each strike, we were not given the opportunity to edit the episodes of the offending material before they were removed. What was once an open and helpful dialogue with a small start-up had become the kind of frustrating customer service experience you have with a corporation. On Soundcloud’s website, this is what they say vis-à-vis copyright, with the relevant information bolded. We have always set out to build a diverse, collaborative community of creators, where everyone gets credit for the content that they make and own, and where the rights of creators are respected. You are responsible for all activity associated with your account, including all content that you post. If you post content that belongs to someone else (for example, if you are a distributor or promotional agency acting on behalf of an artist or label), or if you use someone else’s content in a remix or other similar work, it is your responsibility to ensure that you have the permission of all relevant rightsholders in order to post that content to SoundCloud. Anyone uploading another person’s content without the necessary permissions is liable to have that content removed or their account terminated. If you are unsure whether you can upload something, read our copyright information pages. If you feel that someone is infringing your copyright, tell us about it. This means Zefr is YouTube’s copyright enforcement manager. The announcement is light on the hard details of what the two companies plan to do together, though Zefr states it will “better understand the sharing of content on the platform.” Some users are worried it could mean a stricter copyright enforcement and more ads. Around this same time, FACT mag reported that remixes made by people who owned the rights were being yanked from the platform, and that whole legitimate accounts for radio stations were being shut down. On Wednesday, FACT reported Soundcloud had done this again, to popular London station NTS Radio. The writing was probably on the wall after the company signed a deal with Warner Music last year, and started to negotiate with other record labels as well. With looming lawsuits and a need to pay rights holders, as well as a decision to run ads against music so they could monetize, the company had to switch gears. The ensuing year hasn’t pitted Soundcloud against artists as much as it has pitted artists against Soundcloud and their own record labels. What the Heck Is Going on With Instagram and Soundcloud Right Now? A separate source explained that SoundCloud is at risk of exhausting readily-available funds and will likely require an ’emergency bridge,’ either from existing investors like Union Square Ventures, or alternatively, a bank, by the end of this year. On timetable, sources couldn’t specify the exact ‘runway,’ or exact time remaining under static financial conditions and no additional funding. But two sources agreed that the situation could become quite serious if additional funds aren’t secured by the end of this year, ie, within 4-5 months. What happened to our small podcast is something that, on the one hand, we entirely understand; we respect the rights of artists, and if a track of ours is considered in violation of DMCA rules, we don’t want it up either. But this is an issue of communication: Soundcloud has essentially punished people who’ve long believed in their platform, and then poorly explained why tracks that had been allowed to exist on the site for years were suddenly pulled—if responding to users’ dispute claims at all. To have years’ worth of archives all of a sudden be our account’s death sentence meant that we couldn’t realistically do anything to fix it, even though we wanted to. We just had to wait and see which tracks they’d suddenly penalize us for (another unappealing option was to find the time to re-edit swathes of back episodes to remove all music). When we found out which ones were the problem, Soundcloud offered no feasible way to move forward. Now the work we did is relegated to the elephant graveyard that is the internet, probably only to live on in my hard drive. What remains isn’t content, but the memory of those early days, when pressure from record labels and their bank accounts wasn’t driving the company’s agenda. What’s the future look like for Soundcloud? We can all probably guess; there’s just nothing we can do about it.